I am working with a lovely couple on a pretty significant renovation; the centerpiece of which is a contemporary, open kitchen. The kitchen's going to be spectacular. It has a separate freezer and refrigerator, a 36" induction cooktop, a dramatic ventilation hood, a built-in oven and a built in microwave. Built-in appliances are a nice touch and a great way to make a kitchen appear to be more sleek and streamlined. 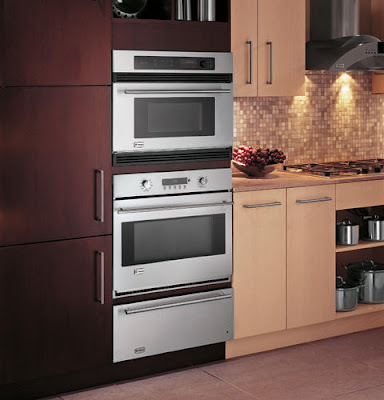 The oven and microwave are going to be stacked in a tall cabinet like this set up from GE Monogram. Almost, but not quite. My clients had already researched and selected their appliances prior to retaining me, so I didn't have a whole lot of influence when it came to selecting them. Now, my clients are perfectly lovely people, but they went to Sears and bought a full suite of Kenmore Pro appliances. In Sears' defense, they have decided to throw themselves back into the appliance world and they have been spending gobs money bringing in new product lines and rebranding themselves. This is all well and good, but it's still Sears. Appliances are a very specialized product and they need to be sold by highly trained salespeople. No one would ever think to buy a car at Wal-Mart (I hope), but for some ungodly reason, a lot of people have no problem going to a big box for an appliance. Such purchases have an unacceptably high rate of bad endings if you ask me, and so long as I have breath to speak, I will never send someone into a big box for an appliance. So my clients gave me a list of their appliance model numbers pretty early into our working together. Those model numbers allow me to look up the specifications and sizes of each appliance. This is wildly important information, especially when it comes to handling built-in appliances. 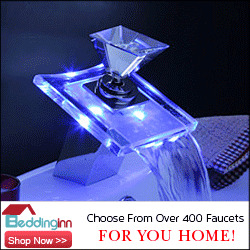 With regular brands, I go to the manufacturer's website and look up the specs. All appliance manufacturers have special pro sections on their sites where people like me can go to get the information we need to do our jobs. Combing through appliance specs at nine o'clock at night is the "glamour" part of kitchen design by the way. Actually, I don't mind it. It's quiet, kind of nerdy work that requires a fair amount of concentration. Appliance manufacturers have dimension guides that cover every conceivable measurement anybody could want. You see, there is no real standardization in their industry, and none of them have ever met a whole number that was an acceptable dimension. For example, A KitchenAid KEBS277S measures 29-3/4" wide by 28-3/4" tall. But not so fast, they are the dimensions of of the front of the appliance, and while important, they are not what I'm looking for. Its maximum recessed width is 28-5/16" and its maximum recessed height is 27-1/2". 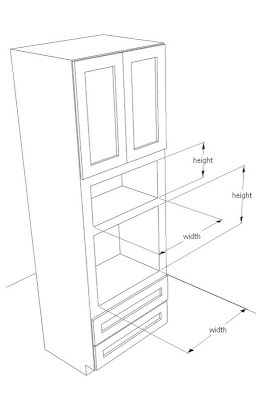 Those recessed dimensions are closer to what I'm after, but what I really need is the guidelines for the opening dimensions in the cabinet where these appliances will actually be built in. In case you're wondering, those dimensions are 28-1/2" by 27-3/4". We always use width before height so if you want to sound like you know what you're talking about, rattle off dimensions as width first then height. Anyhow, the point of that is I need those dimensions so I can have a cabinet built that will fit these appliances exactly. If I can't tell the cabinet maker these dimensions he can't build me the cabinet I need. They have to be exact because we're talking about a several thousand dollar cabinet here and there's no such thing as a return for custom work. So if I screw this up, I'm buying the replacement. Trust me, it's a mistake you only make once. No two wall ovens and no two microwave ovens have the same dimensions, hence my making such a big deal out of this. Now, built-in microwaves are a bit of a scam if you ask me. Most of them, regardless of the brand, are actually counter top microwaves with what we call a trim kit wrapped around them to make them fit into a hole in a cabinet that's the same width as the oven below them. 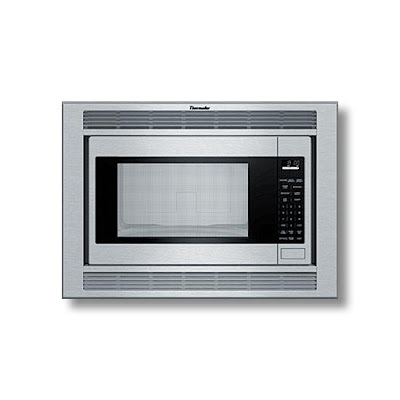 So when I get specs for a built in microwave, what I'm after really is the dimensions of the trim kit and the opening dimensions for the cabinet. 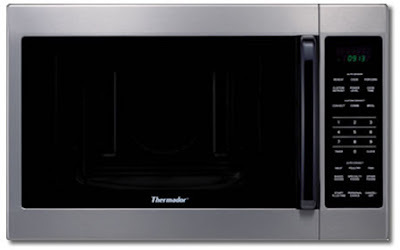 This is a Thermador countertop microwave oven. 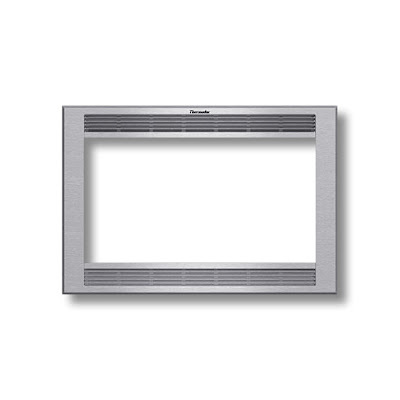 This is a Thermador trim kit. Presto change-o, it's a built in microwave oven! Now, I have never pulled specs for Kenmore appliances before. So I went to their website and expected it to work the same way just about everybody else's does. But alas, it does not. Sears' website stinks. It spends more time touting the virtues of the Blue Crew than it does dispensing information. It's difficult to navigate and the information I needed was buried. There was no pro section and no dimension guide. Ridiculous. So I found the information I needed for everything after taking too much time, and I thought I was wrapping up when I entered the model number for the trim kit. There was no trim kit that matched my model number on their website. In fact, there were no trim kits period. Nice job Blue Crew. The site listed a toll-free number and they assured me that it was staffed by trained professionals. I called. I poked through their phone tree and got connected with a guy who put me on hold immediately. The line went dead after a couple of minutes. Grrr. I called again and got a woman who put me on hold immediately. Double grrrrr. When she came back to the line I introduced myself and told her I needed some dimensions for the trim kit for a microwave oven. I explained that there was no mention of the trim kit on the website and that I couldn't order a very expensive kitchen until I got some dimensions. She put me on hold. She came back on the line and I gave her the model number for the microwave and the trim kit. She looked up the microwave first. "Sir," she said, "that's a counter top microwave." I explained that I knew that and that all built in microwaves were actually counter top microwaves in disguise. This was news to her. I asked her to look up the dimensions for the trim kit. "Oh sir, that's in a different book. I need to put you on hold again." She came back to the line, "we don't have any dimensions for that." I did not lose my cool. I explained to her that I had a list of model numbers from a Sears in Florida and that my clients had indeed purchased a trim kit from Sears. "Well, I don't know what to tell you sir." That's weird," I told her, because I couldn't find it on their website either. "Well, I wouldn't know. We can't get to the website from here." I told her to forget I ever called, and I called the local Sears where the trim kit had been purchased originally. I combed through their phone tree too and finally reached someone in their appliance department. He couldn't help me because he had customers waiting and they were short handed. He knew what I was talking about at least and he took my number and promised to call me in an hour with the dimensions I needed. He called when he said he would but the only dimensions he had were for the trim kit itself, not the cut out the trim kit fits into. In frustration I finally drove over to Sears and measured their floor model myself. 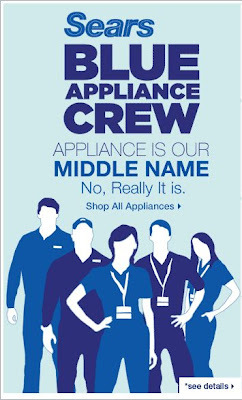 This is not the way to run the show when you want to become a player in the appliance business Sears. Why not take some of the serious cash you're spending on the Blue Crew TV and print spots and spend it instead on updated spec books and some training for your trained professionals? This doesn't bode well and you can rest assured that you have a kitchen designer in Florida who's actively pointing his clients as far from your doors as he can. I'll say it again, please buy your appliances locally, from people who know and understand what they sell and who make a living wage. Aggravating to say the least. And totally incompetent!! Three (or maybe it was four) weeks ago, I drove 30 minutes out of town specifically to go to a kitchen showroom and get prices for cabinet doors. I happened to get there at noon, and everyone left for lunch, including the girl at reception. She told me someone else would help me. So I waited for "someone else" to get off the phone. When she finally did, she ignored me. So I told her I was there to look at some doors and get prices. She had no idea what the prices were and didn't know the name of one of the doors I liked. She took down my name and contact info and told me someone would call with the prices. Still haven't heard back from them. Talk about sh*tty customer service!! A couple of weeks ago, I called to ask when our countertop was being installed. The guy told me October 7th, give or take a day. Well, nobody called to confirm so WE called THEM on the 6th and left a message. They called back on the 7th and said we were scheduled for the 14th. Which is six weeks after the templating was done and we were told the countertop would be installed 3-4 weeks after the templating. Meanwhile, we're in limbo waiting for the countertop so we can move ahead with our kitchen makeover. Sorry for the rant -- I totally feel your pain!!! Booooo Sears!!!! Excuse my long winded rant but this kind of incompetence is enraging. Especially when it's coming from a national retailer whose advertising is trying to sell me on their competence and know-how. Is it too much to ask for them to back of their claims with some actual competence? Grrr. It's taking six weeks to fabricate counters? Good Lord! What can possibly take so long? I have them turned around in two weeks and I think that's too long. I feel your frustration. I went through the exact same spec nightmare a few years ago! Thanks for being the voice of the professionals; I couldn't have put it better myself. Hello, Sears, anyone listening??? We vowed to never buy another appliance from Sears last year after a totally ridiculous run-in with a store manager over the price of a washing machine which -- surprise! surprise! -- had changed overnight by several hundred dollars. It seems that the salesperson I had spoken with the day before had neglected to tell me the price was a SALE price and said sale was ending that very day. We marched right over to Lowe's and gave the several hundred dollars extra to them. Phone calls were made. Letters flew. The Sears District Manager offered us close to a thousand dollars in coupons to "make it right". We declined. Now all we buy at Sears is vacuum cleaner bags. The revenge of the consumer! Yes, I had the same issue Paul - extremely frustrating. Their online specs need a serious upgrade. They don't understand what it means to enter the pro market. Anywho --thanks for writing this. I'm REALLY glad to know it's not just me. Clearly all of these wildly coincidental experiences are evidence of a HUGE problem Sears needs to address. Hi Paul - love this post. I totally feel your pain. The other thing that frustrates me is when you phone the manufacturer's customer service for some detail that is essential to designers but not in the specs, and they instantly know the answer. I mean, it's great to have the answer, but why on earth don't they put it in the specs? Jamie, Nancie, Kelly, Pam and Clarity; thanks for your comments. And to think I was hesitant about going live with this one. Seriously, I thought I was the problem, that I was asking the right questions or looking in the right place for answers. But that's just me. After all, I'm supposed to know the answer to everything. Hah! I got over it as I was driving over to Sears to measure the damn thing myself. So Jamie, I hope somebody is listening. Nancie, good for you and spread that story to anyone who listen to it. These kinds of frontline gaffes are inexcusable. Kelly, you're right. Entering the Pro market means more than spending money on a booth at KBIS. Can you imagine the fun a Kenmore integrated fridge would be. Kenmore: please don't add an integrated fridge! Pam, it's really heartening to know I'm not unique in this frustration. Manufacturers need to back up their attempts to enter the pro market. It's as if all of their energies are directed to end users, but they ignore the intermediaries (that's us) at their own peril. Clarity, thanks for the comment! Your frustration's certainly felt here. I am usually looking up specs late at night and I need that information in front of me when I go look for it. Can I invoice Sears for missed deadlines and the resulting delays? Hah! Paul, I kept nodding along with your post. The parallel between car shopping and appliance shopping is dead on. 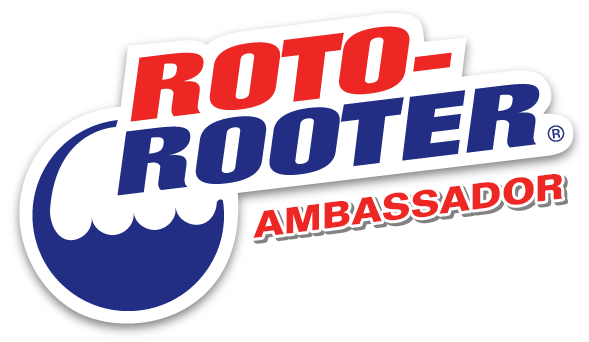 As a independent, family-owned appliance retailer we get to offer the specialized, personal service that some big box retailers struggle with. We pull specs for "intermediaries" all the time. Designers and builders are often so stressed when they call up, looking for hard-to-find specs. I loved when -- after delivering exactly what they were looking for, pain-free -- I'd hear this surprised sigh of relief. Thank you for your comment, one of the cool things about Twitter is that it puts me in contact with other independents like you. I would be lost without the independent appliance seller I use and you guys have my undying gratitude and loyalty! This website always helps me with Kenmore actual appliance dimensions... I hear your frustrations! Anon: Anybody with an opinion that's worth something cares enough to have a name.